"Jean Claude Jones was born in Sfax, Tunisia and moved to France as a young child. 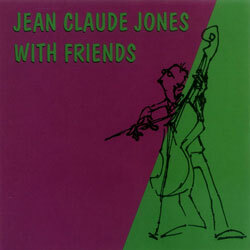 As a teen, he Jean Claude (JC) Jones was born in Sfax, Tunisia, and moved to France as a young child. As a teen, he taught himself simultaneously to play lead and bass guitar. At the age of 17 he began working in professional pop and jazz bands. In 1978 he moved to the US to pursue formal music studies, graduating from the Berklee College of Music in Boston, where he majored in jazz guitar. He continued his studies at the Music Institute of Technology in Los Angeles. In 1983 he emigrated to Israel, where he became a key player on the newly developing jazz scene. Several years later he made a definitive switch from guitar to double bass, and became involved in free improvised music. In time, he added electronics and computer-manipulated sounds to his musical arsenal. In 2016 he returned the guitar as his main instrument. JC Jones is an esteemed music educator, and served as chair of the Jazz Department at the Jerusalem Academy of Music and Dance between 1996 and 2000. He has performed and recorded with many leading international and Israeli musicians, dancers, poets, and vocal artists, including Stan Getz, Red Rodney, and Dave Liebman. Since the 1990s he has appeared with John Zorn, Anthony Coleman, Ned Rothenberg, Joey Baron, Marc Ribot, Ikue Mori, Mike Patton, Damon Smith, Joelle Leandre, Slava Ganelin, Steve Horenstein, Albert Beger, Arkady Gotesman, Avishai Cohen, Ariel Shibolet, Harold Rubin, Victoria Hanna, Josef Sprinzak, Amos Hetz, Anat Shamgar , Felix Ruckert, Dieter Hautkamp, Julyen Hamilton, Mark Dresser, Barre Phillips, Bert Turetzky, Irina Kalina Goudeva, Raymond Boni, Raphael Saint-Remy, and Denis Fournier. Some of JC's major projects include Deep Tones for Peace performances, the Kadima Triptych Series (cds/dvds/texts featuring double-bass masters), Myelination (the myelin chemical sounds and improvised music), and The Temperamental Duo, a collaborative work on Lydian + Explorations with composer/reeds player Steve Horenstein. Since 2016 he has been working with prepared acoustic guitar, in multiple collaborations and recordings with several eminent musicians. Ongoing works includes Keep on Dancing, duos recordings with percussionists Haim Peskoff, Haggai Fershtman, Omri Mor, Denis Fournier, and JC on prepared acoustic lap-style guitar, Sick Puppies In Love duos with vocalist Anat Pick, and guitars duo recordings with Raymond Boni." "Albert Beger (born 1959) is a saxophonist, flutist and an academy lecturer from Israel. Beger is a composer in the fields of post-bop, hard-bop, free-jazz and avant-garde music. Albert Beger was born in the city of Istanbul, Turkey, in 1959 and immigrated to Israel with his parents when he was three years old. From an early age, he was exposed to the cultural fusion in the new born state of Israel, a mixture of Eastern-Europe, Western-Europe and Arabic food, clothes and music. In his youth, he was mainly listening to the pop/rock music of the sixties, and got carried away in the prog-rock wave of early seventies. Upon listening to Jethro Tull's music for the first time, and hearing Ian Anderson's flute - Albert was immediately attracted to the sound that was produced by the instrument and during his army service he got himself a flute and started learning the instrument by himself. Post his army service, Albert studied classical music with legendary Israeli flutist Uri Teplitz, while discovering the tenor saxophone in the age of 25-26. According to Albert, the flute couldn't carry the energy that he wanted to produce and the tenor fitted right for this need. AT the age of 27, Albert received a scholarship from the Berklee School of Music in Boston and went to study in the prestigious institute for three years. This is time when he was introduced with the more free shapes of jazz, and was introduced to the music of Albert Ayler, Coltrane, Cecil Taylor and Art Ensemble of Chicago. In 1995 Albert released his debut album The Primitive, a collection of early compositions that gathered together to make a surprising debut. This Life followed in 1997 and was released in Israel by the biggest record label in the country NMC records, and got a distribution deal from Columbia Records. Art Of The Moment followed in 2000, featuring Menachem Zibziner on Guitars, Gabi Meir on Bass and Amir David on drums. In 2003, a turning point in Albert's career, he was signed to the new label Earsay's Jazz, by producer Yossi Acchoti, with a request to follow Albert for future albums to come. With Earsay's Jazz, Albert released Hevel Havalim in 2003, with his new trio (including Gabriel Meyer on bass and Hagai Fershtman on drums), and Listening in 2004 with his quintet (the former album trio augmented by Yoni Silver on alt saxophone and bass clarinet, and Yiftach Kadan on guitar). In 2005, Albert received his first formal recognition from the country, when he won the Landau Award for Performing Arts. In a jazz festival that year in Tel Aviv, Albert shared the stage with two of the most dominant figures in the free jazz world - Hamid Drake (drums) and William Parker (bass). Albert, Drake and Parker, booked a studio session and recorded couple of Albert's compositions, and the session was released in a two volume album called Evolving Silence (released 2005 and 2006). In 2008, Albert had released his eight album Big Mother. Big Mother dealt with the topic of ecology and the danger human beings cause the planet. This album was the first to include a pianist (played by Aviran Ben Naim). The year after, Albert received Israel's highest honor for musicians, the prestigious Prime Minister's Award for Composers. In 2010, Albert had signed a record deal with the relatively new label Anova Music, and released Peacemaker, a six piece conceptual suit." "Jean Claude Jones was born in Sfax, Tunisia. He moved to France at a young age, where he taught himself to play bass and lead guitar. At the age of 17 he was playing in professional popular music and jazz bands. In 1978 he moved to the US where he pursued formal musical studies. In 1981 he graduated from the Berklee College of Music in Boston, where he majored in jazz guitar, and moved to Los Angeles where he studied guitar and bass at the Music Institute of Technology for two years. He emigrated to Israel in 1983 and became a key player in the newly developing jazz scene. In 1986 he made a definitive switch from bass guitar to double bass, and became involved in free improvised music. Over time he added electronics and computer-manipulated sounds to his musical arsenal. JC Jones is an esteemed music educator and served as chair of the Jazz Department at the Jerusalem Academy of Music and Dance between 1996 and 2000. He has performed and recorded with many leading international and Israeli musicians, dancers, poets and vocal artists, including Stan Getz (1985), Red Rodney (1986) Dave Liebman (1988). Since the 1990s he has appeared with John Zorn, Anthony Coleman, Ned Rothenberg, Joey Baron, Marc Ribot, Ikue Mori, Mike Patton, Damon Smith, Joelle Leandre, Slava Ganelin, Steve Horenstein, Albert Beger, Arkady Gotesman, Avishai Cohen, Ariel Shibolet, Harold Rubin, Victoria Hanna, Josef Sprinzak , Amos Hetz, Anat Shamgar, Felix Ruckert, Dieter Hautkamp, Julyen Hamilton and others.